Hi Happy Labor Day it is steamy and cloudy in New Jersey today. I saw this plaque in at a sale and I had to purchase it for over my dining room doorway. I added my own touch by dry brushing antique silver paint over the relief. It has that old world charm and feel to the piece. I love the touch of elegance it brings to the dining room. 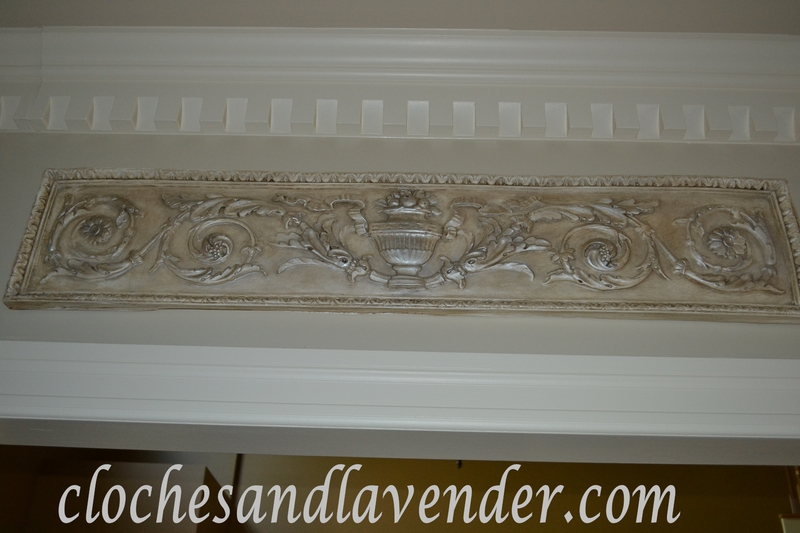 I love it, and your molding!!! thanks for sharing. Thank you. Our dental molding is very large. Thanks. It is really overcast today here in Jersey. Thank you. It is terrible in Northern New Jersey what part are you from? Happy Labor Day to you too. It is cloudy and storms are on the forecast, but no rain down here in the south yet. I love pretty plaques like this and the way you painted it really makes the design stand out. Thanks for sharing it with us. Thank you so much for your thoughtful and kind comment. The antique silver paint makes the piece stand out but not too obviously. You did a great job on it. love it – and the addition of the silver paint makes it even better! This looks amazing Cynthia! The silver paint really gives it the “old world” look. Sure wish we lived closer. I would love to decorate with you. How pretty that is!! I love it. I also have the same pillar that you are using for a candle holder and I LOVE kitchen spice scent by Bath and Body!! Did you painted the details silver? or did it come like that? I painted the details silver. Very parisienne! I love sales too and this week found art inspirationa t a car boot sale..doyou have car boot slaes inthe US? I have never heard of that term before. We have garage sales, estate sales and yard sales in the US and just regular sales at stores. Thanks for your kind comment and I hope you follow Cloches and Lavender. I love your plaque. Beautiful job! Gorgeous piece for over your door! Thank you so much. I hope you will follow Cloches and Lavender. 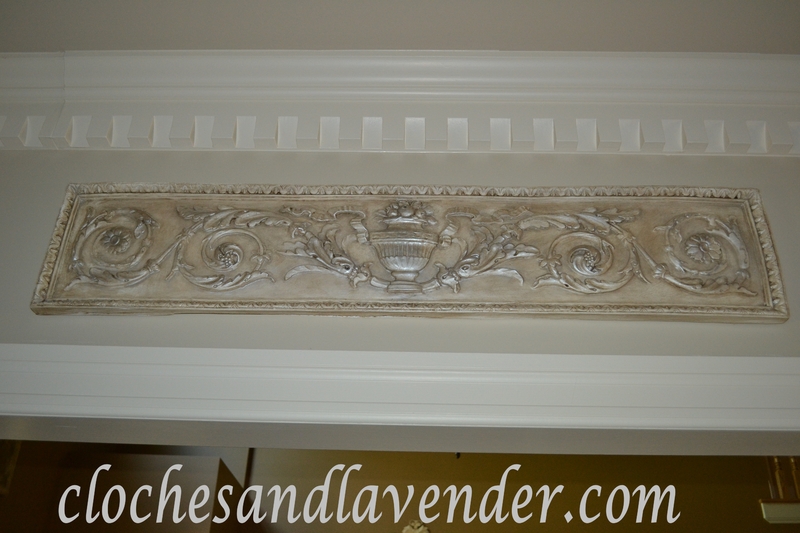 Love the plaque and the wonderful finish you did!….Beautiful Cynthia!